And it would make all the difference - yet, it has to be welcome or the person is likely to not only continue doing what they are doing but to put extra emphasis on it and send them busting even faster down the ill chosen path. Then, you have your own reputation - "the old man just likes to sit over there and pontificate." In a way, that is how I have felt over the last few months - advice, instruction, guidance....they are all the same thing. You offer it up...it goes ignored....and the people that you tried to assist end up in the exact problem that you saw coming. Yet, most people are just plain stubborn. Perhaps they just flat out enjoy the extra drama and stress that their actions bring. "Nutster, why do you have a burning desire not to be wrong?" - is more on point. Do you think the difference between the two is merely semantics? If so, you may want to consider a redirection of your thinking. The need to be right - is a very ego driven need. There insinuates a desire to hold this self- righteousness over others so one can be above them. Not my gig. Heck, just about everyone that I compare myself is better than me in any field of endeavor I have ever chosen. The need to not be wrong - is an effort to help. There is a humbleness to it. To not contribute to what is off-line. You are either part of the problem or part of the solution. But the truth of the matter is - that a lot of people don't want to help themselves so they don't want to be helped. For a Virgo like me, that's a hard pill to swallow.....and a difficult tongue to bite. So, if you need some help - give me a shout. I won't come looking until I hear your call. What is the one thing that everyone acknowledges exists but can not be seen? Atheists, agnostics, Christians, Muslims, and peoples of all over the world will agree on one thing that has the most mystical and mythical of qualities. Evidence of it's hand surrounds us. We see trees near the ocean growing strangely at 45 degree angles. We see tens of thousands of cars left abandoned by the roadsides in Louisiana. Trailer parks from around the world beckon it's arrival. Of course, it is the wind. One of the wisest of men of all time, King Solomon, wrote an entire book of the Bible on the wind. Even if you are not of Christian bent, you could spend your time reading few pieces of literature more enriching than Ecclesiastes. It to be one shortest and one of the most accessible books of the Bible to read. Like any good piece of philosophy, it leaves you with as many questions as it does answers upon reading through it. "Everything under the sun is meaningless, like chasing the wind" Eccl 1:14. Solomon continually makes reference to the meaningless of the things that we do in life and uses "chasing the wind" as his simile at least five times in this brief but powerful work. Look around today and, in these times, realize that those who are dying senselessly in this world are in a better place. Also, in the true wisdom of Solomon, he draws a solid curtain of pessimism that invites the reader to push through to find the ultimate optimism. Solomon allows the wind to blow us to his conclusion in Eccleasiastes 12:12, "But my child, be warned: there is no end of opinions ready to be expressed. Studying them can go on forever and become very exhausting! Here is my final conclusion: Fear God and obey his commands, for this is the duty of every person. God will judge us for everything we do, including every secret thing, whether good or bad." As for the wind itself, here in the Sacramento Valley, we are blessed by a natural wind that floats up from San Francisco Bay and fights against the current of the Sacramento River and the Delta System that takes our water to the ocean. It is called the Delta Breeze. It is a blessing. It cools many of our hot summer nights and brings us respite from what would be many days of consistent oppressive heat. The Hawaiian Islands are legendary and so pleasant because of the Tradewinds. The temperature of the surface of the ocean rarely changes. The constant breeze that blows across the ocean provides a natural evaporative cooling system that makes all of us yearn for the tropics. Sacramento and Hawaii are not the only places that pay homage to invisible. I deemed that a cut and paste from Wikipedia would be interesting to my readers around the world. Do you experience any of the below on a regular basis? Do you have your own that is not listed? I'd love to hear about it. Perhaps your own story about your relationship with the wind will be a future topic for SundayScribblings. In ancient Greek mythology, the four winds were personified as gods, called the Anemoi. These included Boreas, Notos, Euros, and Zephyros. The Ancient Greeks also observed the seasonal change of the winds, as evidenced by the Tower of the Winds in Athens. I have a challenge sometimes with literal-ness - For example, I was tasked with writing about the things that you would never write about. Right off the bat - you can see the problem. Once you write about it, you wrote about it...and the word "never" was just negated. It actually goes deeper - I hold trust and truth very deeply in my core values set. Can I honestly say that I have never told a lie? Of course not. I don't believe any of us can. We start to get into that area of debate of what constitutes a lie. "It was a little white lie, so it wasn't a lie." "I lied to spare their feelings, so it wasn't a lie." Hey...a lie is a lie - and I have told some lies and I will probably lie again. But, I try not to - because it is a violation of my core value of trust. If someone lies, how can you trust them? "But, Nutster, everyone lies. You just said so. Does that mean that you don't trust anyone?" - boy, what a way to live that would be. We all must trust. Without trust, intimate relationships are not possible. Yet, I do have a tendency to be extremely careful with my trust. Trust is not freely given in Nutsterville. It is earned. Now, let's get back to the root of the problem of this writing assignment - it really is the word "never". What if I was to say that I would never write about something. Let's pick a topic. Child abuse. ....I really dislike breaking commitments - so, my solution? I make fewer of them. Which is better? - to make 10 commitments and keep 8? or to make 5 and keep all 5? Which side of that coin do you want to stand on? You do know that you stand on one of the sides whether you actually have ever said that you do or not. Player A got more done....but he broke trust twice. Player B was very trustworthy....but paled in comparison on the accomplishment scale. Oh, how easy it is to twist our minds in knots - isn't it? 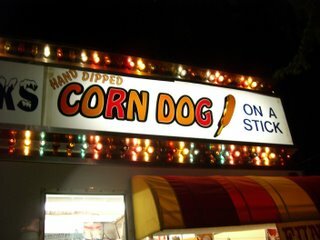 If it wasn't on a stick - it wouldn't be a corn dog!!! Well, season one of Arena Baseball came to an end last night - I believe that our troop made it through the campaign with a 1-5 record. Most of our losses were lopsided affairs so I feel particularly concerned about the one team that we beat. As mighty Casey came to bat - (this would be me) for his last at bat of the season, he looked around and saw the bases loaded. His previous 5 or 6 at bats were mostly little dribblers. While not a tremendously able batsman, this particular night was even below his low standards. The pitch is delivered! - it arcs in over the plate.............BAM!!! The ball flies off the bat toward the right field banner and strikes it with a thunderous thwap. The crowd goes wild - as they realize that mighty Casey's team will only lose by about 20 points rather than 24. But, more importantly, after the game - the mighty Casey proudly says, "47 years old and still hitting grand slams against all of these kids. Hey, at what point do I get to be proclaimed as a medical marvel?" ....and the little 6 yr old boy says - "I don't know but you sure have a sense of humor!" Maybe you had to be there - but it was a pretty funny line. Yes....that's right...I said - RANT! I was given this topic yesterday - and could have cranked out this post right then in a couple of seconds. I decided to delay because I thought that I should take the time to put up a picture of a fortune cookie. "I'm going to give the fortune cookie industry one more chance" - you see, for some time now, I have actually raised the point that fortune cookies aren't really fortune cookies anymore. At some point, that entire industry got together and decided to change. The industry failed again yesterday - they failed to the point that I don't even remember what the insipid cookie spit out as a "fortune." I didn't even bother saving it for the purpose of this post that I knew I was going to do. Furthermore - I went to a clipart site....saw some choices for fortune cookies....and said, "this industry is a mess. They don't deserve a picture." Now, if one should appear with this posting, it will have been because I somehow came across an interesting situation and did a "back-edit" and added it later. I can guarantee you that the picture would not be flattering to the FC industry. Fortune Cookies aren't Fortune Cookies anymore!!!! - and mislabeling is lying in my book. I demand honesty! If I end up needing to be the whistleblower on this industry, so be it! Advice Cookies - is sometimes accurate. Observation Cookies - is yet one more alternative to what today's blandless U-shaped wafer should actually be called. "You are charming and your good looks will take you far" - OK....now that is a fortune that I get all the time. And it is on point. But, come on. It's an observation that I and everyone around me already makes!!! Plus, if you are good looking and charming, odds are you can go far. Yes, there is a touch of "fortune" in that message but, by and large, it would be an observation cookie....an accurate observation but an observation nonetheless. The other two categories, wisdom and advice, speak for themselves - and you will have to watch for them the next time you do Chinese takeout. I don't have examples to share with you. I wish I did. It seems like there have been times when I actually have saved the paper remains of a wisdom/advice cookie because it was something that I might want to use in a presentation. Eventually, I end up tossing them when I am doing a massive cleanup (like the space that a "fortune" takes up really makes any difference in the overall tidiness of my abode). I can't find a single "fortune" around my entire house.....testimony to how pathetic the fortune cookie writers have gotten. Who are the fortune cookie writers anyway? - have you ever met one? Do you know of anyone that has ever claimed to do that job.....even in their spare time? I haven't. I have been walking around this orb for close to half a century. I have talked to a lot of people. I have heard interesting stories about various jobs that people have held......not one person has ever said, "yeah, back between '73 and '74, I spent time writing fortunes for cookies." Never have I come across that. What are the job qualifications? - now that I am on to this, I am thinking that maybe I should apply for the job. Hey, if you just complain, you are part of the problem. I want solutions. I am an action man. Can anyone out there give me some vocational guidance? I would like to do some research into this possible career path change. Hey, I'm in midlife. It would be a radical shift but that's what happens around this time. What would the pay structure be like? - paid by the hour or by the fortune? What is the productivity expectation? - 1 per hour? 10 per day? 1 a minute??? This is important if I am going to make this shift. What about copyrights and royalties? If I write one, how many times does it get copied and stuffed into that cookie? While this may come as a shock and seem impersonal, the truth is, dear reader, that somewhere on this planet, several other people are getting the same "fortune" as you. Sorry to break that to you.....don't ask me about Santa Claus and the Easter Bunny either. Perks? - unlimited soy sauce and crispy pan fried noodles? Can I negotiate for added Mongolian beef and GOOOOD, GREASY chicken chow mein? If so, we may be able to put a deal together. "You've put on a few pounds....read the fortune...don't eat the cookie"
Summary - I think we are entering a pivotal time for the Fortune Cookie industry. They have either got to go back to taking some chances and start predicting the future again or they need to come clean, reinvent themselves, and go through a PR campaign to more appropriately name their endeavor. With more people becoming aware of this scandal combined with speed of spreading this news on the internet, they are going to need to act fast.